SSC CGL Tier-1 2016 was conducted first time in Online Mode in 43 Batches from 27.08.2016 to 11.09.2016 at about 415 venues in 96 cities throughout the country. In Srinagar, this exam was conducted on 25.09.2016. Against 38.04 lakh registered candidates, about 14.99 lakh candidates actually appeared in the said Examination. The Staff Selection Commission was quick to release the response sheet of students within 30 days this year. 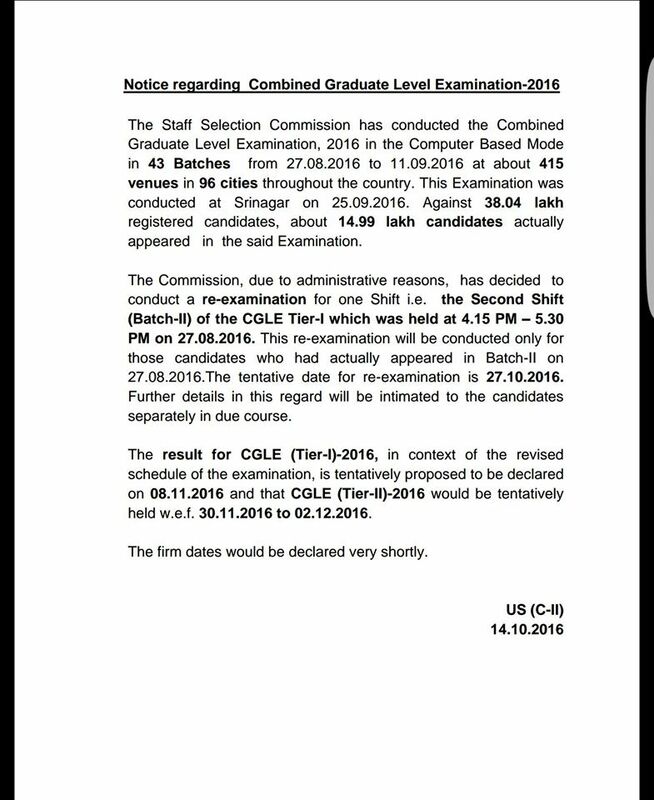 After that, students and various websites started predicting cutoffs along with the date of declaration of CGL Tier-1 2016 result. Today, SSC released an official notice regarding the Result. According to this notice, the Result of SSC CGL Tier-1 2016 is tentatively proposed to be declared on 08.11.2016 and the SSC CGL Tier-2 2016 would be tentatively conducted between 30.11.2016 to 02.12.2016. The reason for this delay is, the re-examination for one Shift i.e the second shift on 27.08.2016 which was held at 4.15 PM - 5.30 PM. The screenshot of the same is attached below.